the sonic base material of the interactive sound installation »grenzenlose freiheit« (»boundless freedom«) are recordings of different urban contexts. they are represented by three aural excerpts each. the installation is controlled via three wirelessly connected handheld computers (pdas), which are hand out at the visitors. each computer is assigned to one of the urban contexts. the visitor is able to select one out of the three sounds and to influence their characteristics. additionally, the sound material can be arbitrarily positioned in space. therefore 24 loudspeakers are used, eight speakers in each of the three contiguous rooms. 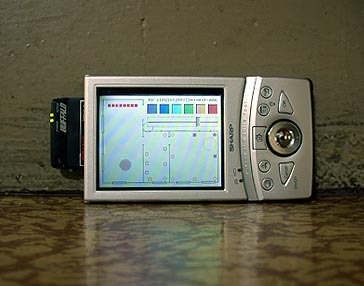 the screens on the pdas show the floor plan of the three rooms and the positions of the speakers. this way the current location of one's own sound item as well as the sound items of the other two visitors can be followed easily. while operating the sound installation »grenzenlose freiheit« the visitor becomes a discoverer, a performer, an instrumentalist or the subject itself. closing doors of a subway, noise of the construction site, a cash box in a supermarket, a tibetian monk's drum - situations like that are the visitor's starting point for his sonic interpretation. excerpts of urban contexts get overlayed, shrunk or stretched. movement in time is made available for acoustical experience. the sounds, controlled by the three visitors, appear overlapped in a newly defined sonic space. they will notice some effects of group dynamics in a playful way, such as bothering each other, entering the personal atmosphere of another visitor, working together. at last, musical structures might get created collective. the basic idea of the installation »grenzenlose freiheit« arose from intensive consideration with the utopia of a concept of open form. the title hints at this undertaking. the installation was developed at the electronic studio of the berlin technical university by using modern mobile computer technology. this way, the visitor has a plain graphical user interface to his disposal while not restricting his mobility. the pdas are communicating via a wireless network with each other and a host system, where the realtime sound synthesis and the spatialization over 24 speakers take place. for the sound synthesis process, the composer's tool grinder by gerhard eckel is used. it implements a kind of granular synthesis (so called fog synthesis). tiny pieces of the sound material ("grains") are singled out of their context and get processed depending on various parameters. according to the special design rules of the grinder, these parameters are stochastically applied to the grains. the visitor provides a set of basic conditions for this stochastic process, which ends up with a certain sonic situation. such a situation may appear as stable and changeless, it may slowly change over long terms or may have a volatile and inhomogeneous characteristic. the ease of handling with those situations hints back at the urban attitute of life and at "boundless" (german "grenzenlose") chances of mobility and change.